This giveaway has ended and the winner is Kentuckygent53! Snipping tool screen grab below. KG, when you get time, please e-mail (pm works too) me your USPS address. I have been eagerly anticipating this for months now. I may have mentioned how Krampert's Finest has streamlined production to make it easier for us. Well, it's also better for you our friends. There has been grumbling on the 'net about our labels, justifiable grumbling. Yes, I heard them, but not every problem can be addressed immediately. Then there is the option of the "permanent" flask as storage for our products. Once we had the flasks the bottle became a refill and would be in use for only a short time. But I also understood that not everyone would want a flask. Yet the old labels went unchanged for too long. Frankly, we didn't like them either, but again, things are gotten to as they can be addressed. This announces "Out with the old and in with the new!". The old Avery labels are a thing of the past as of today here at Krampert's Finest. 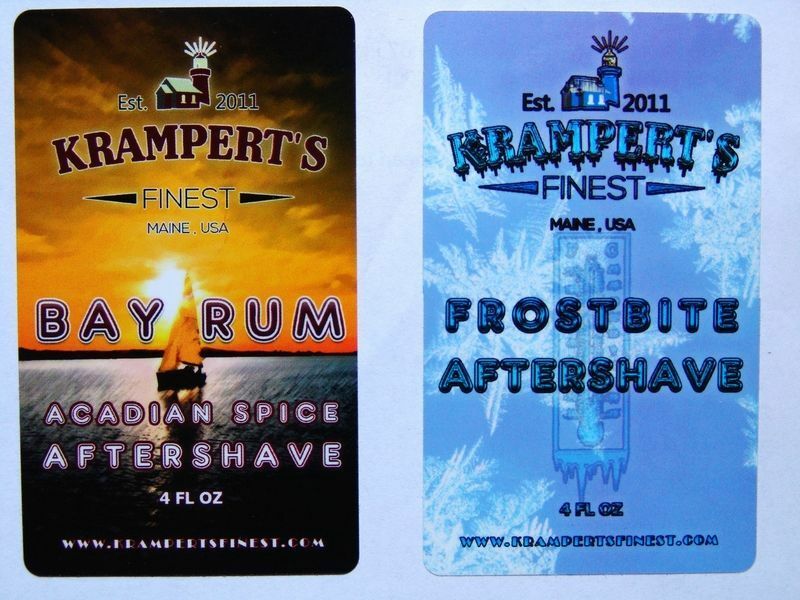 The new labels on the Acadian Spice Bay Rum began shipping a few weeks ago, today the new Frostbite labels will begin to ship. They are a professionally designed and printed label that no one will have complaints about, and they're just drop dead gorgeous, but then I'm prejudiced toward them. Right now I'm the only source for them, but the retailers will follow suit as they run out of old stock. Here they are on paper. OK, now the giveaway. There is one string attached. I'm giving away one bottle of each product (2 in total) to the winner and there will only be one winner on this and each of the forums where I'm doing this (4 forums total so 8 bottles total). I only have the picture of the labels on a piece of paper. I want a picture of the bottles posted from the winner after the bottles are received. You can make it a fantastic photo or just a plain Jane picture of the bottles. Just post it in this thread. Have no fear! If you can't take a picture and post it, just ask me and I'll do it for you before they ship. So anyone can win these. Just post your user name in the thread and tell me that you want to participate. I'll consolidate the names in a list in this post, so watch to make sure your name appears on the list. It's your responsibility to double check me. I won't leave anyone off on purpose, but I'm human and I make mistakes. 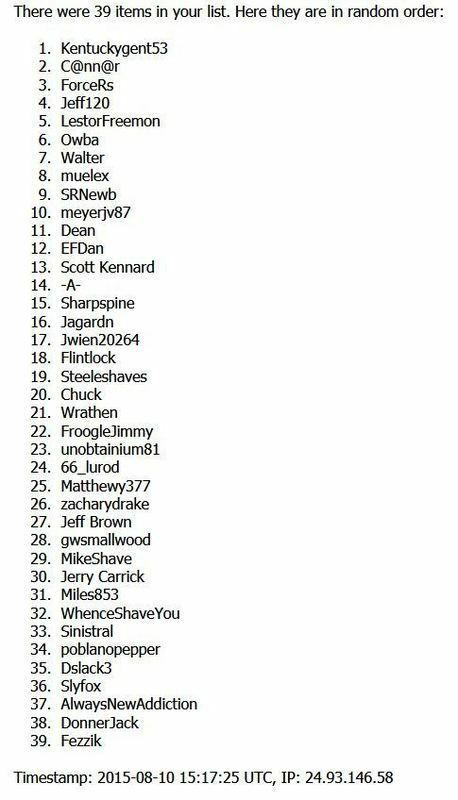 The winner will be selected by a list randomizer when I think it's gone on long enough. It'll probably be about 2 weeks until I have the list randomized. If you are across the salty pond, I can't send them to you, but that doesn't mean you can't win. Use your imagination... That's all I'll say regarding it. If it turns out that you haven't made arrangements, then I'll pick the next person on the randomized list. You can only win once no matter on how many shave forums you enter. It will be possible to enter 4 times to increase your odds of winning 2 of the 8 bottles. No, I won't advertise the other forums here. I'm in this. SRNewb. I would love more of your AS. It is some of the best that I have ever used. Owba here. I'd love to try out some Krampert's!! gwsmallwood is game. I've never tried any of your products, so I'd love the opportunity. Miles853 - I'm in. Nice shiny new labels.